Are you truly "100 %" ready to acquire Grants, Loans, & Investors to get the funds to Tie your Business Ideas into Reality? Then, accept our #100Challenge to Get the Right Paperwork & Assistance you need for Only $100 (tax included)! 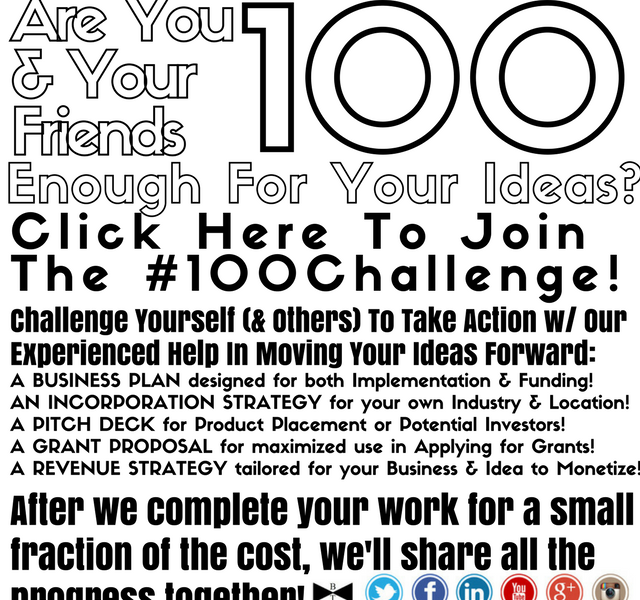 Our #100Challenge is simple: For only $100 & your Commitment) to moving forward (typically a $300-500 value each), we grant the 1st 10 Entrepreneurs their choice in 1 of 10 crucial needs that sink 1,000s of small businesses daily! We'll also Promote your business's progress on Black Tie's networks in Facebook, Instagram, Twitter, LinkedIn, Tumblr & More! Submit your payment here: https://goo.gl/MBwjbz We'll take care of the rest! Prefer a live representative? E-mail relliott@blacktiemanage.com or call (661) 418-7830 for assistance! RULES: There is a limit of 2 deals per person & will cap at 10 deals total monthly from the 60+ online applicants from Linkedin, FB (including FB Groups), IG, & various professional/fraternal groups with the Code "BOB2B". The promotional value of this deal begins the First (1st) through the 10th of Every Month. This deal is valid for refund via cash back if work is not completed within the same month of order. This deal can not be combined with other offers. And, yes, your $100 will include sales taxes associated; govt. fees not included for filing. REFUND POLICY: If the work is not finished by Month's End, we will provide BOTH 100% refund + 100% work completed. No questions asked! TIP: Once this deal is redeemed, you must visit www.BlackTieManage.com & click "START" to complete our Questionnaire for optimal results!